I sold this instrument in April 2017. It’s unusual in having a history so I’m reproducing the details here for the longer term. This is a 56 key Wheatstone tenor-treble Aeola. Serial number 23657 is in the period 1891 to 1910 for which no records survive. This one would have been made roughly half way through that period, around 1900. It is a top quality professional instrument with steel reeds in concert pitch, nickel ends and buttons, original six fold bellows and it’s original case. It is superb player with a huge dynamic range and will play from a whisper to a remarkably loud full volume. An all to unusual feature is that this instrument comes with a story. I was asked to sell it for the great-nephew of the first owner who was Martin William Henderson from Cullercoats. 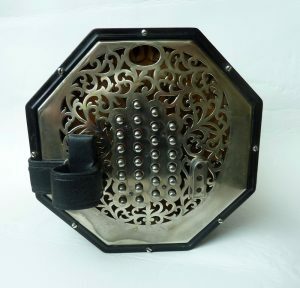 Henderson was born in 1880 and was blind almost from birth, he showed an early aptitude for music and was presented with this concertina by Sir James Knott. 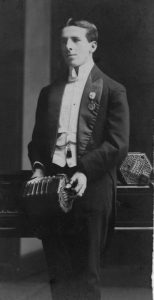 He would have been about 20 when the concertina was made. With this instrument he played the music halls throughout Europe and as far afield as Australia. He returned to Cullercoates in 1920 where he lived until his death in 1941. 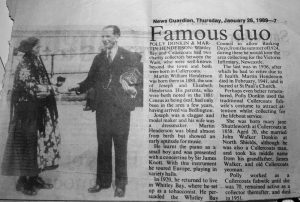 The newspaper cutting from 1969 and a photo of Martin Henderson as a young man are included in the sale. This stage covers the modifications to the bass action. The new bass plate fitted in place after marking out and drilling 12 holes on a rectangular grid. The holes are reamed to about 10mm to accommodate an 8mm button and .9mm bushing of woven felt. 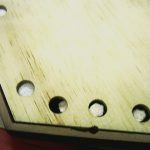 The holes are slightly conical getting larger towards the inside of the box to keep a good fit on the outside, but to allow some tolerance in alignment of the axis of the button with the axis of the hole. I borrowed this technique from concertina construction. Next task is to reconfigure the mechanism to pair up bass and chord melodeon style (vertically) rather than stradella style. This is the stradella layout, also showing the air button which is badly placed for melodeon playing, more of that later. The pallets also need to be re-faced so I’ll do them while the mechanism is out of the way. I’m hoping I can reuse the wire rods and just shift them to different positions. So it will have to be new rods then. The buttons are real mother of pearl so I’ll need to be careful to avoid damage when removing them. Gentle heating with a gas flame softens the original adhesive which looks like shellac and they pull of easily. Fortunately the rods are made of 1.5mm steel wire, exactly the same material as thin filler rod for gas welding which I have a stack of. So its down to a couple of hours of careful bending and fitting to get the new rods made and installed. Now its time for the reeds. The reed work was fairly straightforward because the client has his own custom layout which is partly unisonoric and has no thirds in the chords. The D/G version of this layout is available here on melodeon.net.The unisonoric notes were able to use the original unisonoric accordion reeds as they were. The chords each have three reeds either tonic+fifth+tonic, or fifth+tonic+fifth, the choice being used to keep all the chord reeds within a compass of one octave. Finally, I fitted a catch for the bellows lock to the bass block, replaced bellows gaskets and one or two other minor bits of tidying up and the job is done. I found Clive’s unisonoric layout is very easy to adapt to after only playing conventional melodeon basses. .. and here it is, all done, in action! It’s a *fabulous* box to play; light, fast, great sound, and as flexible as my Mory (it’s got the same semi-unisonoric layout on the basses). It’s in Bb/Eb of course. And these are the tunes that came out when it said hello: The Wrong Turn is a waltz/mazurka thingy written by Anne Marie Summers, English bagpiper, probably best known for her duo with Stephen Tyler on Hurdy Gurdy, and the trio Wendigo (with Julian Sutton). Played from *distant* memory, so it’s probably some way away from the original tune! The Sportsman’s is a traditional tune, and one I’ve known for ages, but only recently come back to playing after we’ve started using it in our Vivant stuff (slower than I play it here). I have another Hohner Regina 12 bass waiting to be united with a Preciosa if anyone wants one! This project to convert an 8 bass Hohner Preciosa to 12 bass by uniting the treble side of a Hohner Preciosa with the bass side from a Hohner Regina piano accordion. here are the two boxes at the start of the project. But that’s not quite all there is to do. The arrangement of the bass buttons has to be completely changed. The buttons are to altered to a retabgular grid, instead of the skewed pattern at present. The function of the buttons also has to be changed from a stradella system, to a custom melodeon system. This will require modifications to the reeds, and to the mechanism that connects the buttons to the reeds. First task is to make a new button panel to replace the one with skewed button layout. Removing the old panel is nice and easy because it is glued in with that wonderful substance: hide/scotch/animal glue. It softems in water so just apply some water to the joints, leave for half an hour, scraping off the surface glue after a while and eventually it comes out without damage. soaking the glue prior to removing button board. Now to prepare the replacement. A suitable piece of plywood which should be less prone to distort than the original, and some white pearloid that is not quite an exact match, but pretty close. To glue these together I simply flood the surface of the wood with acetone, place the pearloid sheet on top, and clamp for a couple of hours in this wonderful nipping press. Then with a bit of measuring and four cuts on the saw we have the new board ready to mark out and drill. Done a few years back this is a sequence of photos that documents the restoration of a mahogany ended 30 button anglo that had many common woodwork defects. These had to be put right before there was a chance it would play properly. The action boards had several shrinkage cracks like this one. These are common, especially in cheaper instruments made with badly seasoned timber. Shrinkage can also lead to failure of glued joints here leading to large gaps opening up between the action board and the frame. … and slightly thicker pieces for the open joints. Buttons before and after cleaning. The top row of buttons are as found with a thick accumulation of dirt. The bottom row have been cleaned by scrubbing with detergent solution.